I don’t do this often, but when a book comes highly recommended by the Sage of Northampton, bears a foreword written by him, and is signed by both the author and the Foreword Writer, I do not argue with Fate. Bought immediately, and paid for international shipping too. The reviews on Amazon are glorious, and reminds me of pre-Jonathan Strange/Mr Norrell buzz for Susanna Clarke. (And that reminds me that I should probably reread that book too). A genre that has been reduced by lazy stylisation to a narrow lexicon of signifiers … wizards, warriors, dwarves and dragons … is a genre with no room for Bunyan’s Pilgrim’s Progress, arguably the earliest picaresque questing fantasy; for David Lindsay’s Voyage to Arcturus with its constantly morphing vistas and transmogrifying characters; for Mervyn Peake’s extraordinary Gormenghast books or for Michael Moorcock’s cut-silk Gloriana. It is certainly a genre insufficient to contain the vegetable eternities of Catling’s Vorrh. Here’s where you can buy a signed copy. (No guarantees though, as the small print says.) Apparently all of the signed copies are sold out, and I got one. The confirmation email came in today morning. 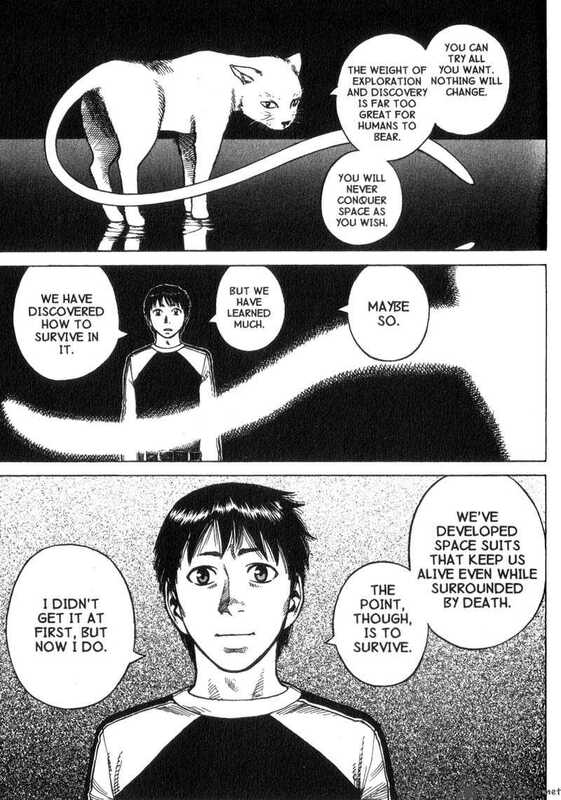 Other than that, I have been rereading some old manga favorites. Among them is Crying Freeman. I bought the complete Dark Horse set a while ago at the low low price of $1 per volume – I have the Viz comics and you will agree that reading them pamphlets gets a little annoying, even though some of the coloring adds to the eightiesness of the series. It’s over-the-top seinen action, with lots of photo-referenced art by Ryoichi Ikegami, and it is just as I remembered it – brimming with the kind of content that sets librarians and conscientious parents aflutter, the kind of salacious visuals that attracts giggling clusters of school-kids in Landmark, where the books stay misfiled in the children’s section. Crying Freeman is the kind of thing Dr. Fredric Wertham warned the world about, people. Do not file it in the children’s section, not unless you want kids to wonder why women have white areas in their groin, whether Chinese assassins really strip to their underwear before jumping up on Russian wrestlers’ shoulders, and if it is possible for a man to cover himself in cement and not burn to a crisp when attacked by a janitor with a flame-thrower. And how a Japanese man can be a master artist, a master assassin, and the Greatest Lover Ever. This book is testament to the fact that manga writer Kazuo Koike is what Stan Lee would be without the Comics Code Authority to keep him in check. And Crying Freeman is what an Amitabh Bachchan character would really be in the 70s, without the castration anxiety of the Indian Censor Board. Mull about the ocean of possibilities for a while. 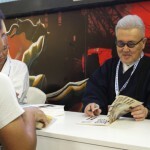 This reminds me that the high-point of Comicon this year was getting to meet Koike in the flesh. I queued to meet him three times, just because there was a 2-item cap on signatures; I probably would have gone a few more times had there not been other events to attend. 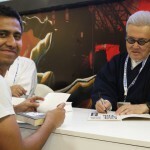 Kazuo Koike, man. Never thought I would get to thank him in person. Insert a twenty-one gun salute moment for Dark Horse Comics here. 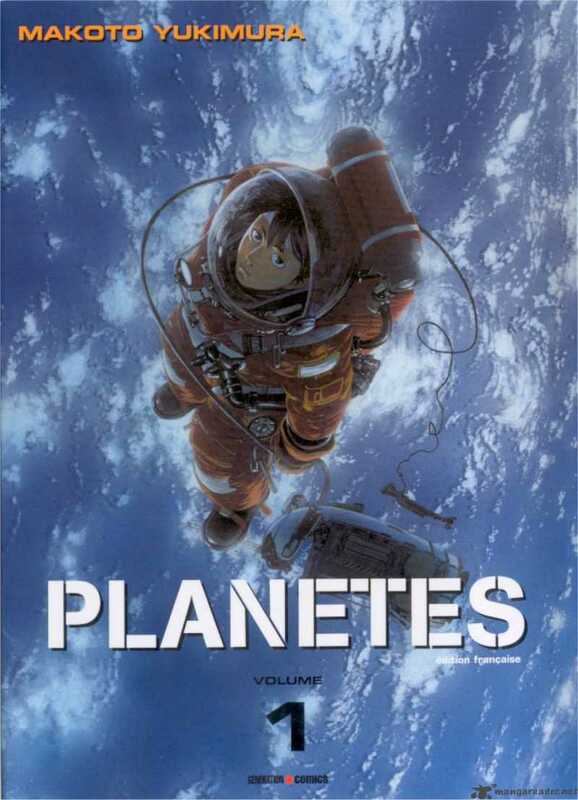 The other series I read – after a gap of nearly seven years – was Planetes by Makoto Yukimura. Long out of print, I picked up the series on a whim from a collector whose bookshelves I emptied back when I was an established Emptier of Bookshelves, a veritable patron saint of Liquidators. (Ironically, swathes of my floppy comics are now making their way to different parts of the world, as I succumb to Omnibus upgrades). 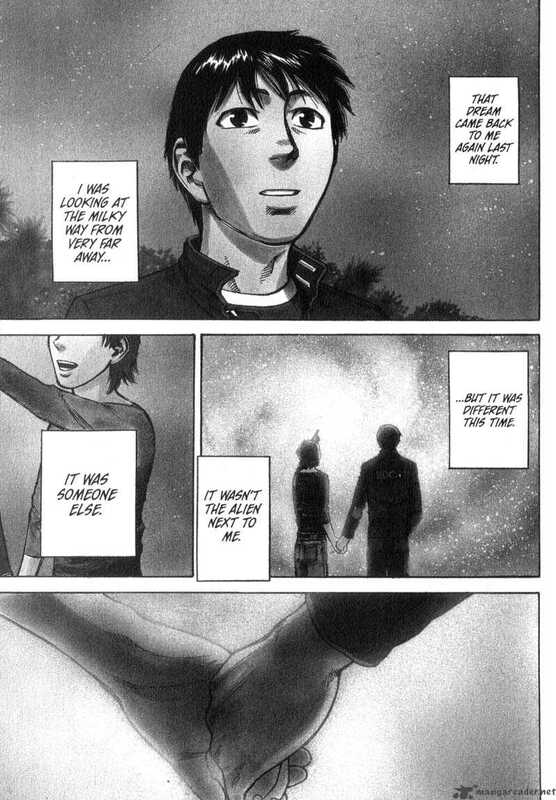 Coming back to Planetes, this is the sort of manga that serves as a gateway to anyone not used to the medium. It’s a series of interconnected glimpses into the lives of a motley crew on board an orbiting garbage disposal unit, set in the year 2070 or thereabouts, when mankind has made a little more progress in space travel. 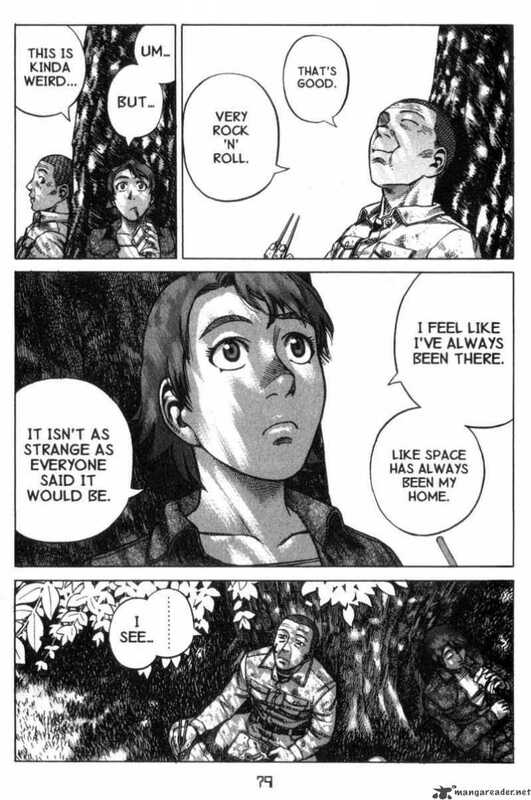 Over the course of 5 volumes, we see how the passage of time affects the daily lives of the astronauts, how their lives and those of the ones they love have intertwined, and the effect that a planned Jupiter Exploration has on them. 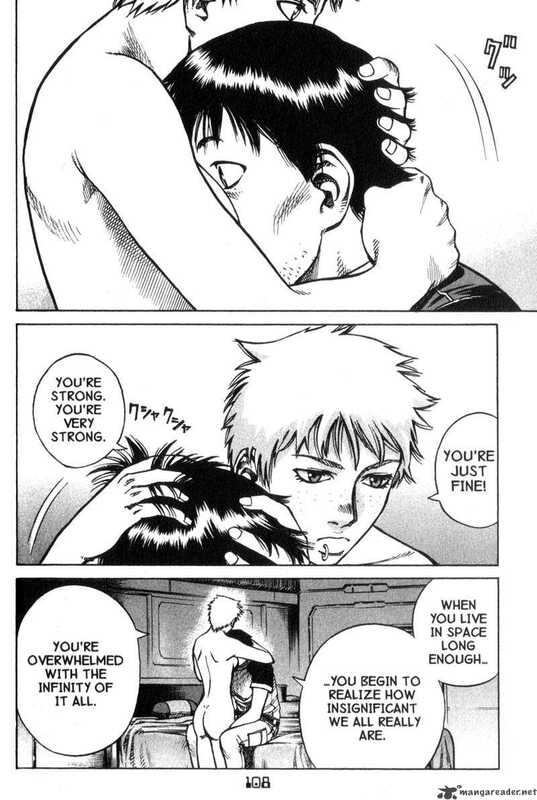 It is the kind of manga that floats around in your brain after you have finished reading it, with a bewildering attention to detail and a penchant for capturing the exact texture of a moment in time. If you have read Ba/Moon’s Daytripper or Thompson’s Blankets, you know what I mean. 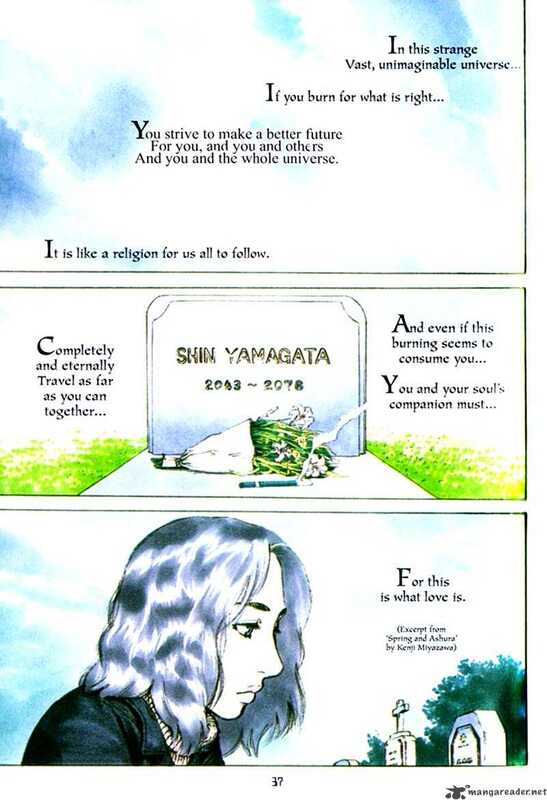 It’s a shame it’s not available on the market at the moment, I wish someone like Vertical would bring it back in an Omnibus (they totally can, it’s Kodansha). I would probably buy it for everyone I know. There is an anime based on the series. I know it’s good, from all the buzz I have heard about it, but I have to finish it some time. I stopped at 2 episodes the last time I started. Or you can read the manga online, for free. Kickstarter is a site that been one of the most interesting things on the web. What is Kickstarter? A way to solicit funding for projects. Any kind of project at all, just as long as it’s original. All you need is a goal amount and people can pledge a sum to help you meet it. The project gets funded if enough people pledge and the goal is reached – or surpassed. Most projects usually have different funding options, with corresponding rewards based on the amount you contribute. And the kind of projects that you see on the site range from the humdrum to eye-poppingly awesome. From producing independent cinema and music albums to developing quirky products like Twine, from producing custom-made espresso machines to starting mobile libraries, Kickstarter is becoming a hub for amateur musicians, artists, technologists and – well, anyone at all – to connect directly with their intended audience. I’ve been keeping an eye on the comics projects. There has been a lot of them. There was a project on an all-female comics anthology, catchily named Womanthology that gained quite a bit of buzz, and a 109,000$ backing. Writer Neil Gaiman and his wife Amanda Palmer kickstarted their American tour last year, raising 133,000$ (out of a $20,000 goal). Digital Manga Press broke new ground in manga publishing by first proposing reprints of an out-of-print volume of Osamu Tezuka’s Swallowing the Earth – a 3950$ goal yielded 8800$ in crowdfunding. Emboldened thus, they recently launched another Kickstarter, one to publish another adult graphic novel by Tezuka, called Barbara. This one still has 5 days to go, and is at 14,600$ for a proposed 6500$ goal. One particular project that caught my eye was Joyce Brabner’s Kickstarter to install a desk and statue in honor of noted comic-book writer Harvey Pekar, in Cleveland, his hometown. For those not in the know, Pekar is one of the pioneers of American autobiographical comics. His long-running series American Splendor, based on his own day-to-day adventures, began in 1976 and went on till his demise in 2010. Since he could not draw comics himself, the illustrations were provided by a variety of artists, ranging from alternative gurus Robert Crumb and Joe Sacco to modern-day cartoonists like Gilbert Hernandez and Richard Corben. Among the rewards that the Pekar Kickstarter had, the most surprising was something that cost 99$. 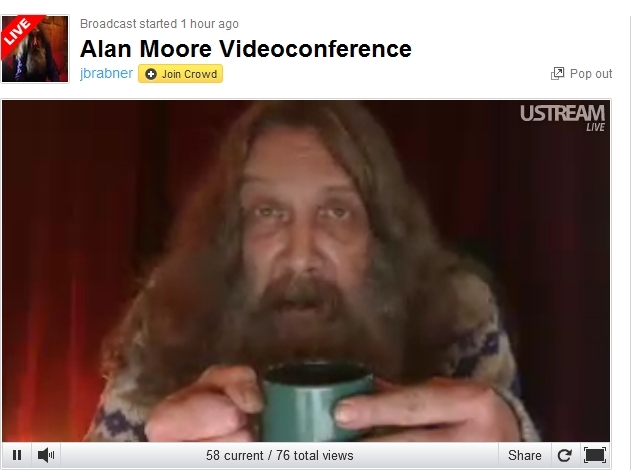 A Video conference with Alan Moore. THE Alan Moore. You know, the guy I keep obsessing about and keep mentioning at every single opportunity. 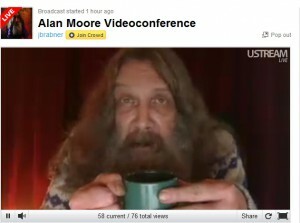 Would I pay 99$ for a video conference with Alan Moore? Seriously? I would have happily paid twice that amount, and that’s as honest a statement as I can express without melting into maudlin sentimentalism and fan-wankery. I paid the money last year, felt flushed with happiness and altruism and nervousness at the thought of actually being able to watch the Mage of Northhampton speak. 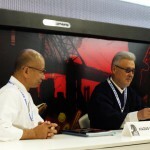 News of the actual conference came in early February – it was to be held on Saturday. I was a little disheartened to learn of the date because I had other plans that day, but as it turned out, I was able to attend part of the conference, knowing that Brabner would undoubtedly put up the video sooner or later online. There was some level of an honor system involved, where we were not supposed to share our passwords to the conference with any non-backers. Some payment issues involved with the hosting company. Regardless of how he comes off in interviews (more than a little disgruntled with the state of affairs around him, that is), Moore is a genuinely funny person. He’s also capable of carrying on a conversation without losing his train of thought or the erudite charm that marks his writing. The conference obviously did not have us all talking to him at once, it was more of a broadcast where he would answer questions that the backers had sent to him prior to the event. But the air of quiet theatricality he brought to the proceedings – hunching his shoulders and rolling his eyes at times, sipping on his cup of tea, and even showing off his shoes – this was something that paid for itself within the first few minutes. And continued for much longer. In the course of two hours and thirty minutes, Moore talked about fans and celebrities, his thoughts on the comics industry, and the possibilities of the comics medium. He went into detail about his thoughts on digital comics, where he distinguished between gimmickry in online comics and actual utilization of this new medium. (“comic companies are taking the same regrettable formulae from the last few decades and plopping them online”). About process, and how he finds all the little details that make his works so much richer. (“You research the place until connections start to emerge.”) He spoke briefly of his beef with Grant Morrison (“I was someone famous that he could slag on”) and about Jerusalem, his upcoming novel, which he calls the biggest work of his life and has about five more chapters to go. There are moments where he astounds – like his aversion to video games because he does not want his audience to control the narrative (“I am a fascist with narrative”). Or when he compares Pro wrestling to Greek theater. And in the answer to my question, he name-drops Craig Thompson. Hoo ah! Well, you can see the video for yourself, it’s online now. There are glitches in the recording from time to time, but ignore them. 2 and a half hours of Alan Moore goodness will make you happy, I guarantee it. Umm, feel free to donate some money to Joyce once you are done at hpekar@aol.com. Not only does she deserve a bit of your money, but she’s also planning to organize a second instalment of An Evening With Alan Moore very soon. Kickstarter is not the only sponsor-game in town, though. There’s Sponsume, which incidentally has an Alan Moore-involved project going on right now, where you can pay for a V For Vendetta paperback or mask signed by Moore. I am a little cash-unrich at the moment, and I’ll pass. If you know me, you know that I have a soft spot for Alan Moore – which is an understatement equivalent to saying that Salma Hayek is just another pretty face, or that GTA is a mildly deviant video game. So you would understand that normally it’s tough for me to sit and write objectively about Moore’s books. The first review I wrote for Rolling Stone was The League of Extraordinary Gentlemen: The Black Dossier, and it was devilishly tough to write, as I sought to bring objectiveness to a wannabe rave bubbling with latent fan-frenzy. After that, I’ve played it safe, and have avoided talking about Moore and his writings. But just this morning I finished rereading From Hell, and the physical need to talk about this work is just too much right now. From Hell is a 572 page graphic novel that presents a version – Moore’s version – of the Jack the Ripper murders. Again an understatement, the book is not so much about Jack the Ripper as it is a deconstruction of Victorian society, as Moore spirals into the murders as the center of a vortex of personalities, (both real and imaginary), coincidences and actual events that spun into and out of Whitechapel in the summer of 1888. The writer is well-known for moulding his scripts to suit the strengths of his collaborator, and Eddie Campbell’s scratchy, black-and-white style is perfect for the book, filtering the image of a sooty, grimy London through jagged lines and blobs of dark ink. But before I talk about the work, it is necessary to put it in context, both from the perspective of American comics as well as from a personal standpoint. Indulge me here, will you? Somehow, post-Swamp Thing, The Killing Joke and Watchmen, Alan Moore seemed to have vanished from mainstream comics. Of course, the facts behind what had happened to make Moore disillusioned with the comics industry are public knowledge now, and I needn’t go into them in detail ( if you’re interested, you should check out interview here. The Wikipedia page should also give a fairly detailed picture of what transpired ). He took a much-deserved sabbatical from the genre that he single-handedly deconstructed in the early part of the 80s, and the later part of the decade saw him being involved with a number of independent, idiosyncratic projects – a mathematics-inspired series called Big Numbers, and a treatise on covert CIA operations named Brought To Light – both illustrated by painter Bill Sienkiewicz, whose own experiments with storytelling were stretching the boundaries of what people perceived as “normal” artwork; there was Lost Girls, a sexually-explicit look at familiar characters from Victorian literature ( a theme that Moore would return to, time and again, in his later work) in collaboration with artist Melinda Gebbie. A Small Killing with Argentine illustrator Oscar Zarate was about a white-collar worker in a typical advertising agency, the work serving as a commentary of corporate culture in the 80s. And there was From Hell. How did From Hell come about? It started in a small independent magazine called Taboo, the brainchild of artist Steven Bissette, the penciller from Moore’s Swamp Thing days. Bissette’s idea was to create a horror anthology comic that was “radical and unfettered” (in his own words). Horror comics in the eighties were still laboring under the legacy of the 1950s – mainstream comics stuck to “safe” subjects that were okayed by the comics code authority, and the indies could not venture beyond a template referred to as “the EC hangover”, stories featuring giggling horror hosts, an old witch or a graveyard keeper, who would serve as the narrators, the tales themselves building up to a twist in the end that one could see coming from a mile away. Taboo was intended to be the complete antithesis of the average horror comic, it was invite-only for a bunch of contemporary artists and writers who could really deliver something out of the ordinary. As Bissette made it amply clear in his “Taboo manifesto”, the intention was “to show the unshowable, to speak the unspeakable” (a phrase borrowed from David Cronenberg), and the invitees were given three guidelines – “it shouldn’t be easy, it should be uneasy, it should make us uneasy”. Taboo was not a spectacular success –it closed shop after ten issues and an annual – self-publishing comics at that time was a hit-and-miss affair, and the adult nature of Taboo’s content did not make its existence too easy. The line-up in those ten issues was stellar – Charles Burns’ Black Hole was first published in Taboo, as was Neil Gaiman’s Sweeney Todd. 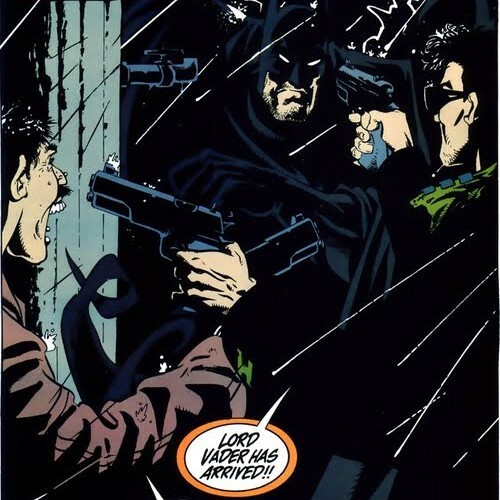 And Alan Moore, responding to his former colleague’s call to arms, submitted a draft of his holistic approach to the Jack the Ripper murders, due to be illustrated by an Australian artist named Eddie Campbell. Thus was From Hell born (You could do well to read the complete account of the formation of Taboo, in Bissette’s own words here). I had heard about From Hell in about 2002, just after watching the movie. I had just gotten a job, and a new credit card, and the wonders of eBay were just making themselves known to me. Add to it the presence of an enthusiastic senior in the US, who agreed to help accept shipped items and send them later to India, and I was a happy camper. If I remember correctly, I paid exact cover price for the book because I had no idea of the concept of sniping and just ended up systematically overbidding. (Apparently the version I own is the movie cover edition, which is no longer in print, and has a slightly higher value in the secondary market. Just saying) It took six months for the book to arrive, along with other assorted comics (Sin City runs, Sandman story arcs, and the first 23 issues of a series called Hitman). It came in through someone who was travelling to Hyderabad for winter vacations, and I remember the fluttery feeling in my tummy as I walked to the address my friend had given me, a little nervousness at whether everything had made it through airport customs safely, and whether the courier himself had any idea of how important this package was to me. Hasty greetings were exchanged, and I fled, taking the books with me. Home had never seemed so far away. I did not read From Hell immediately, though. A lack of comics (if I were to write an autobiography of my life, it would probably be called “a lack of comics”) ensured that I would ration my reading habits, circling around my reading pile by going through the least-important ones first. But there came a day when I could not wait any longer, I just had to read the book, lack of reading material be damned. I read it at white-heat, until I came to chapter 4, where Sir William Gull, physician to the queen, already having been introduced to us as the future Ripper, goes for a ride through London with Netley the coachman. The chapter is dedicated entirely to Gull’s (or rather, Moore’s) commentary on the city – and that’s all I am saying without giving anything away – and reading it made me feel terrible. I remember that I had bad dreams that night, and let me tell you, it’s very very rare that a work of fiction edges into my subconscious. I did finish it, and by the time chapter 10 came along – a chapter devoted to the systematic degradation of Marie Kelly’s body – I had inured myself enough to just take in the panels clinically, marveling at Moore and Campbell’s masterful use of the three-by-three panel structure. When the book was done, I closed it and carefully put it away on my bookshelf. It would be 6 years before I would attempt to reread the book. I had bought a copy as a gift for a friend recently, and while she and I discussed it, I realized I did not remember too much of it, other than major plot points and some key events. Somehow, I dreaded having to flip through the Comic That Gave Me Nightmares. Yes, it was also fear of a different kind– sometimes the second read throws up flaws that one glazes over during the first read. The other was that of experience garnered from reading more and more comics over the years – what if I enjoyed the book more, I wondered, because of my naiveté in 2003? What if it could not yield the same kind of emotional response in 2009? Young Master Crowley has something to say about that, though. Needless to say, I shouldn’t have worried. While I didn’t get nightmares this time ( so far! ), the book still gave me that queasy feeling as I trudged through the streets of London, peeking into the imaginary lives of the four women and the people around them. Chapter 4 and chapter 10 still evoked that potent combination of awe and revulsion that I had nearly forgotten – Gull’s soliloquoy in the middle of the Marie Kelly incident, in particular, took more of my attention this time around. The burn-down chapters – 11 to 14 feel more satisfying because I recognize more of the references this time, and because I have been paying more attention to the story – one of the perks of rereading a book the second time – I found myself able to analyze and correlate the overall characters and events much more carefully. In a way, the second read has helped me appreciate the book even more. For a long time after reading From Hell, I found myself unable to watch movies set in London during that time period. I had to switch off My Fair Lady after about 10 minutes into the movie, because my brain just could not process the antiseptic sets and the overall bonhomie in the most dangerous area of the city. The excitement when Gull uses the phrase “Salutation to Ganesa” the second time, when I finally realize the reason why Moore introduced a real-world character into the story. Incidentally, the book, which is dedicated to the four women (“You and your demise: of these things alone are we certain”), also begins with the same phrase. The first time Queen Victoria appears in the narrative is drawn in a way that takes you completely by surprise. Not just because Campbell’s style changes drastically on that page, but because the entire chapter is written in a way that enhances the overall effect of that scene. It rattles you, the moment when you turn the page and Victoria looms on the page. “Will no one help the widow’s son?” Phew. Campbell’s art changes style substantially in some parts, almost as if there were portions where he was trying out different approaches. Things get a little jarring with the ink wash effect used in chapter 5, when Gull’s everyday life is presented in parallel with that of the prostitutes in the East End. There’s a level of ambiguity in the ending – part of it because of the scratchy artwork, which conveys a more impressionistic version of events, rather than spoon-feeding the story. Which fits in with the theme of the story itself being a filter of the events that we know of, but cannot really verify. The way the last chapter wraps up every theme, every throwaway ( or so one thinks) line from the beginning of the book is very very satisfying. On the negative side, Moore sometimes forces real-world characters too ham-handedly. He also goes to great lengths to identify every historical person being mentioned, and some of the dialog comes out clunky and a little forced. It’s a brand New Year, and a brand new collecting goal is called for. I think I desperately need a page from the book, preferably Chapter 4 or Chapter 10.